Friends! Thank you so much for all of your sweet feedback in my last “Lisa’s Southern Wedding” post. It means the world to me! I’m diving into mine and Dave’s wedding plans today, and I’m excited to share about how we made the hardest wedding decision we’ve made yet—our venues. 1. We are having a full Catholic Mass ceremony, so we need to have our ceremony in a church—preferably a beautiful one that we love and have some connection to. 2. I wanted an indoor venue for our reception, surrounded by beautiful outdoor space for pictures. 3. We were quite set on having a Saturday wedding in May 2015. Syracuse, New York. Pros: It’s Dave’s hometown and his whole family is there. Con: I don’t know anything about the wedding industry in upstate New York and would be starting from scratch looking for venues and vendors. Since Dave wasn’t tied to the idea of getting married there, we crossed NY off of the list first. Austin, Texas. Pros: Dave and I LOVE Austin, and it would be an amazing destination for our guests. Con: Between the cost of an Austin wedding and the travel we would need to do, Austin was both our most expensive and least practical option. Houston, Texas. Pro: My family and many of my friends are there. Con: It’s far away from Dave and I, as well as Dave’s family. While I’m sure Houston could have been a great option, I ultimately decided I wasn’t willing to relinquish quite as much control of the wedding over to my mom or a planner as I would have needed to. Somewhere in North Carolina. Pros: Dave and I adore our church in Raleigh, and it would be fun to introduce our families and friends to our new home state. Cons: The reception venues I looked at near our church tended to lack the sweeping, outdoor views I was dreaming of, and it would be a destination for not one, but both of our families, plus most of our friends. Somewhere in Virginia. Pros: I grew up there, so I loved the idea of getting married in my home state, every reception venue I looked at was more stunning than the last, and it’s a good “halfway” point for our families. Cons: We didn’t know of any churches in the area, and it would still be a destination for our guests. Phew! With all that in mind, we ended up with North Carolina and Virginia in a tie. I dove into research mode, determined to find something before the new year (we got engaged in mid-November) in case I could take advantage of any 2014 rates by booking in 2013–a tip I picked up in Emily’s amazing budgeting post. In North Carolina, we looked into Adaumont Farm, Raffaldini Vineyards, and The Sutherland, to name a few, but by early December, we were leaning heavily toward Charlottesville, Virginia. Dave even flew down so we could drive there together and take a look at a few places. 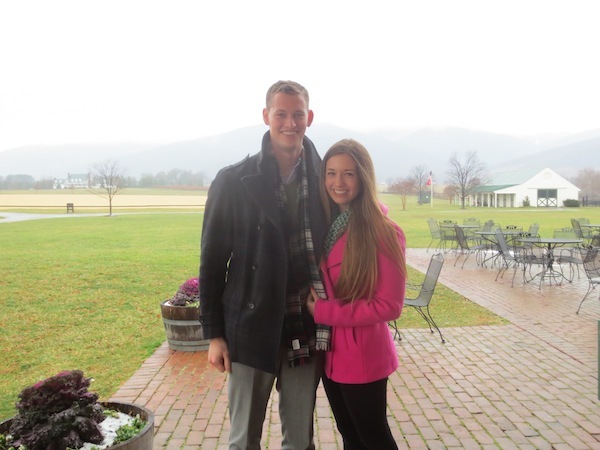 As much as we loved one of the reception venues though (King Family Vineyards), we couldn’t find a church that we also loved, so we left Charlottesville a little disheartened. Dave flew back to New York that night, and I went back to my computer to focus on North Carolina. After a few hours of feeling embarrassingly frustrated, I had a revelation. Dave and I love my church and our priest in Raleigh. When it comes down to it, the ceremony is by far the most important part of our wedding day, and no place was going to feel quite as “at home” as it would there. There was also a reception venue within reasonable distance that I had shrugged off early on as the “too predictable” choice—but in truth, it’s one of our favorite places in North Carolina. I called Dave while he was laid over in an airport on his way home and ran my new idea by him, and as I told him what I was thinking, we both knew it was the perfect fit. And that is how we landed on our venues: the beautiful Sacred Heart Cathedral and the Barn at Fearrington Village! Fearrington already holds so many special memories for both me and Dave–it really is one of our favorite places. The Barn is a relatively blank canvas, and the staff at Fearrington is so wonderful to work with. It’s the perfect place for us to show our guests the country part of NC! Here are a few of my favorite Fearrington wedding picures. Top photo by Nancy Ray, middle two photos by Kate Headley via Snippet & Ink, family photo by Eric Kelley from our V5 Family Heirlooms shoot! How did you go about choosing your venue/venues? Next up, I’ll be telling y’all about our photographer(!! )—that decision was significantly easier than this one! P.S. Fun fact: Ironically, I’m the first Southern Weddings gal who, since starting to work at SW, is having a wedding in the South! Emily was married in her home state of Connecticut and Katharine was married at her alma mater in Massachusetts. That’s how we came up with this series name, Lisa’s Southern Wedding! Thank you, Alana! Dave and I are so excited to get married there!! Thank you! Your feedback from a photographer’s standpoint was so helpful! they’re so perfect!!!! so glad I got to see them in real life! Hooray! Such good choices, and together they encompass such a wide variety of environments – perfect for you guys! LOVE that starry ceiling! Thank you, thank you! Excited for you to see it in person! 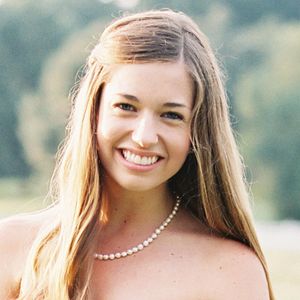 Lisa, as a Southern Catholic lady myself, I am SO excited to follow your wedding planning journey! Definitely looking forward to the personal touches you’ll add to the already beautiful Sacred Heart Cathedral! So sweet of you, Sadie! Thank you so much! Helloooooooo King Family!! Sorry, I got really distracted when I saw your pic there and I recognized it instantly. I’m getting married there in ~2 months (4/12/14)!!!! I’m getting married in May of this year and finding our venue was the hardest part! We chose a destination wedding in the NC mountains and randomly stumbled on the venue when looking for houses to rent on the Sotheby’s website, which is odd, but it turned out to be a hidden gem of a venue! I love reading about your wedding planning! Thanks Molly! Love that y’all found your venue in such an unexpected way! I just realized that a nice way to incorporate Syracuse might be through your stationery/invitations! It’s home to the 2 best letterpress lines in the country, Bella Figura and Smock…and they take a lot of pride in their city! I’m their NC dealer so let me know if you ever want to see the albums in person! Cheers! My heart is bursting with excitement for you! Your church is beautiful and who could resist a wedding by the Belties! :) Twp perfect venues for two perfect people! Big hugs! We had such a similar situation because we both live in Columbia and neither of us is “from here.” But we’ve been attending Trinity Cathedral for years and we knew we wanted to have a full service there. The reception venue was secondary but turned out to be awesome! You won’t regret getting married in a space that is so beautiful and special to you all at once, and you get to re-live a bit of it everytime you go to church on Sundays! I linked the sneak peak from our December wedding so you can check it out :) best of luck to you! Oops – forgot to link it! Lisa this is all so beautiful! I’m so happy you two were able to decide! I started reading this series because of today’s post – I got engaged in December 2013 (in Disney World!) and am getting married May 29, 2015 at The Sutherland, and it’s fun to read about a bride getting married and going through the same timeline of events as I am! Best of luck to you, Lisa!